Presser feet for double needle machineOther Applicable Parts:21010-2 Needle Plate21010-3 Feed Dog.. Plate and Feed Dog for Double Needle Machine Gauge set for bra binding.Other Applicable Parts:23067PF Presser Feet112607SP Slide Plate.. Double Needle Presser FeetGauge set for bra binding.Other Applicable Parts:23067NP Needle Plate + 23067FD Feed Dog112607SP Slide Plate.. Double Needle Dual Compensating Feet (Adjustable)Adjusting both presser feet bases height and pressure independently.Sewing different thickness fabrics simultaneously.Suitable for Machine (*use different presser feet shank):Brother 845Pfaff Double Needle Machine.. 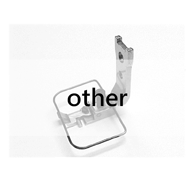 Double Needle Left Compensating Feet (Adjustable)Adjusting both presser feet bases height and pressure independently.Sewing different thickness fabrics simultaneously.Suitable for Machine (*use different presser feet shank):Brother 845Pfaff Double Needle Machine.. Double Needle Left/Right Compensating Feet (Adjustable)Adjusting both presser feet bases height and pressure independently.Sewing different thickness fabrics simultaneously.Suitable for Machine (*use different presser feet shank):Brother 845Pfaff Double Needle Machine.. Double Needle Right Compensating Feet (Adjustable)Adjusting both presser feet bases height and pressure independently.Sewing different thickness fabrics simultaneously.Suitable for Machine (*use different presser feet shank):Brother 845Pfaff Double Needle Machine..
KNT3568L Needle PlateKFT3568L Feed DogNeedle hole diameter : 1.3mmPitch : 1.5mmNeedle Space : 1/4" (6.4mm)Suitable for Machine:Juki 3528-7Juki 3568-7..
KNT3568U Needle PlateKFT3568LS Feed DogNeedle hole diameter : 1.1mmPitch : 1.0mmSuitable for Machine:Juki 3528Juki 3568..
KNT3568U Needle PlateKFT3568U Feed DogNeedle hole diameter : 1.3mmPitch : 1.5mmSuitable for Machine:Juki 3528Juki 3568..